Ooohh. . . the soothing sounds of the water flowing in the brook. 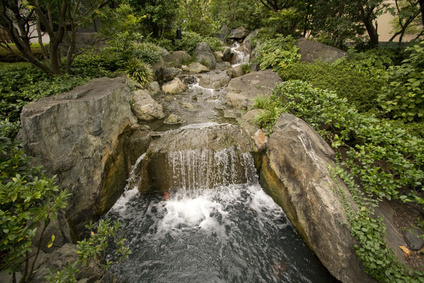 . . flowing over the rocks and spilling over the larger ones like mini waterfalls. . . surrounded by natural plants, shrubs, grasses and shaded here and there by some nice trees. Oh, it is so, so pleasant and enjoyable. Have a little party in the back yard, do some entertaining and let your guests feel the atmosphere of your back yard escape. . . or NOT! Maybe you just want to go out there and enjoy it all for yourself! Either way, any way, there is no doubt that this back yard brook will enhance your experience in your own domain. United Valley Landscaping can help. Give Marco a call at 707-455-7548 and see how easy it is to have this great retreat in your yard.